One of the newest Country Inns in the Canmore / Banff area, the Bear and Bison Inn offers luxurious accommodation with Bed and Breakfast style hospitality. It is located at the base of Lady McDonald mountain in Canmore surrounded by stunning scenery. 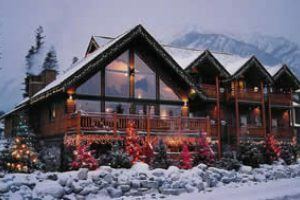 This is an ideal accommodation for romantic getaways, honeymoons, intimate elopement weddings, skiing and winter getaways, management retreat, family reunions, and a base to start and finish your week long exploration of the Canadian Rockies Provincial and National Parks. Children under 12 can stay for free in rooms large enough to accommodate them, which makes the Bear and Bison excellent value for money especially for families. During the months of November, December and May you also have the opportunity to take over this home away from home. The Bear and Bison Inn can sleep up to 20 adults and has full facilities for an amazing family holiday! Contact us for more details or to book this Canmore hotel. When you stay at the Bear and Bison Inn in Canmore, you have the option of dining in or having the included 5-star breakfast delivered to your room. Private balcony or patio - amazing views!